At dawn, I rose and took a badly needed shower. The first scoop is cold, but you quickly get used to the coolness. We packed our bags and had the usual oatmeal porridge for breakfast – how great you feel when you eat porridge in the morning! So far, our Nordic stomachs have worked well in spite of the tropical challenges, maybe thanks to the porridge. The porridge was accompanied by the malaria medicine Malarone, and – to prevent dehydration – one glass of water and one cup of tea. The fluid balance is important to keep in mind in this hot climate. It takes a while to make friends with the heat, but you do get used to it little by little. We put our bags in Tuto´s jeep, and when we left we were certainly packed. There were suitcases, backpacks, briefcases, handbags, a power saw besides car owner Tuto, his sister Emma with her son Merje, the mother Julienne, Yapeco and us two mondele, that is Bernt and I. 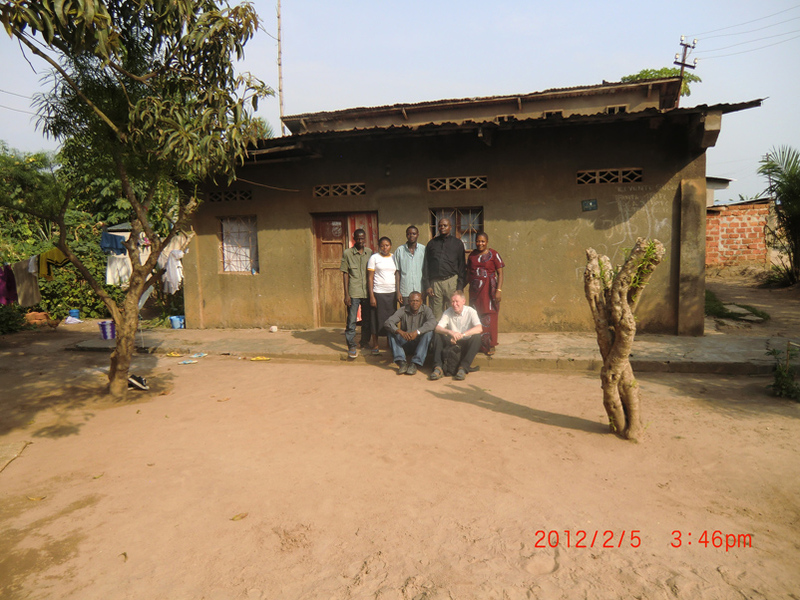 We made for the church where the Nyambudi brother and sister are members. It is called the Evangelical Church of God. 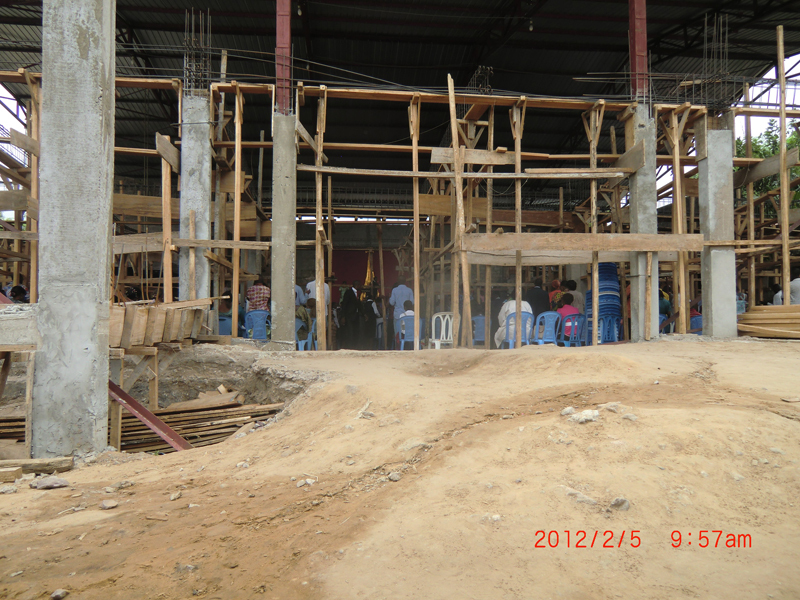 We arrived at a church that also is a building site. Being a building constructor myself, I am always interested in the way buildnings are put together. The framework was made of steel, and the roof of sheet metal. The walls, mortared in concrete bricks were halfway finished. At the moment, the builders were engaged on forming the beams that will carry the gallery. Below the gallery, there were much shoring, that is struts that holds the molds of concrete in place. Within the walls, there was room for about 400 people. We came around 10 o´clock, when the first service already was going on. The language was Lingala. 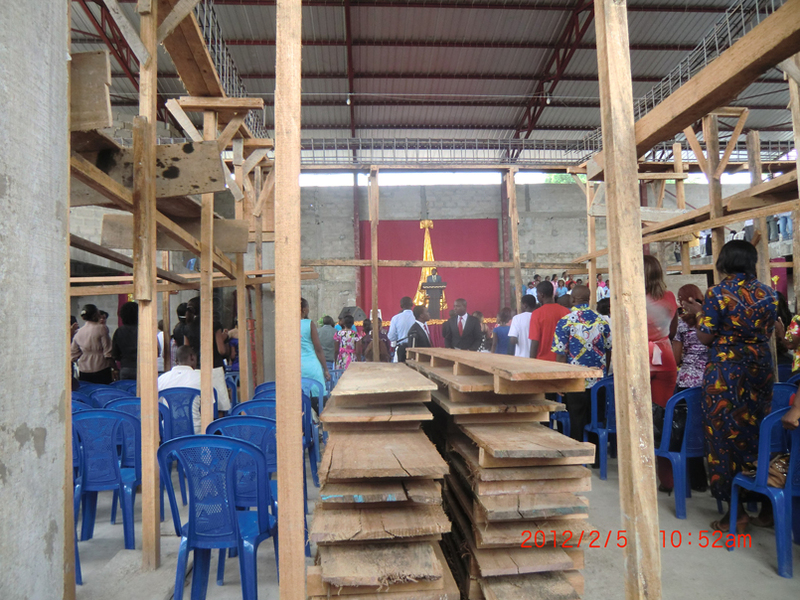 At 10.30 the second service started, in the languages French and English. While we were waiting we sat down under a roof outside the church. 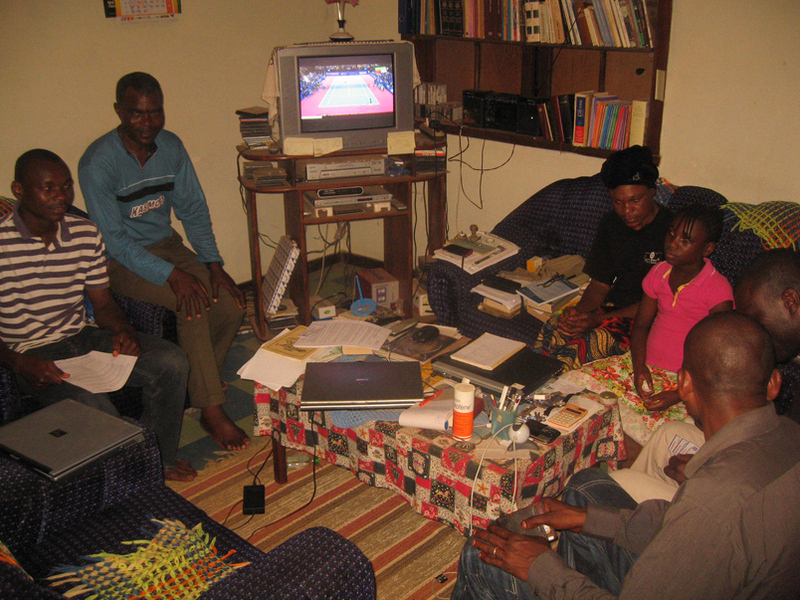 The children who had participated in Sunday school waited with us, but they were waiting for their parents. The style of the service was joyous, with a lot of singing and great committment in what was taking place. 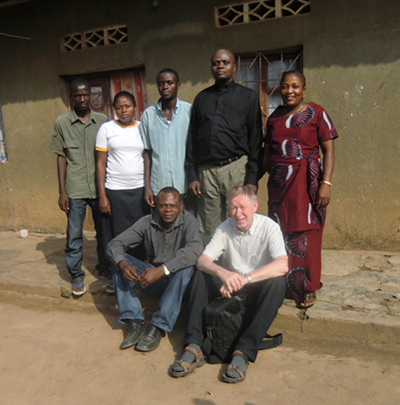 We were very well received and we were asked to write a little about who we were and what we are doing in Congo. One hour later we left for Kimpese. We made a stop in Inkisi. 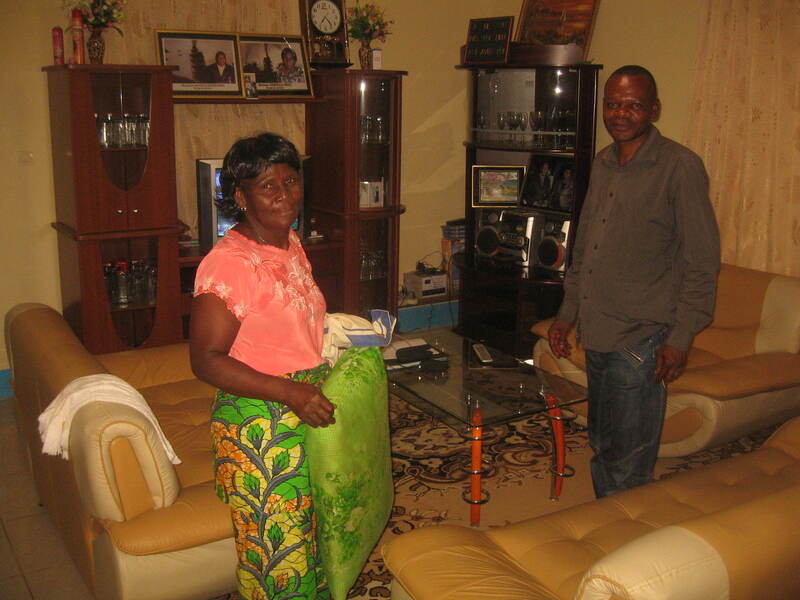 Damas Mangikulua, former pastor of the Baobab Church, has been moved here. He belonged to our first group of entrepreneurs. 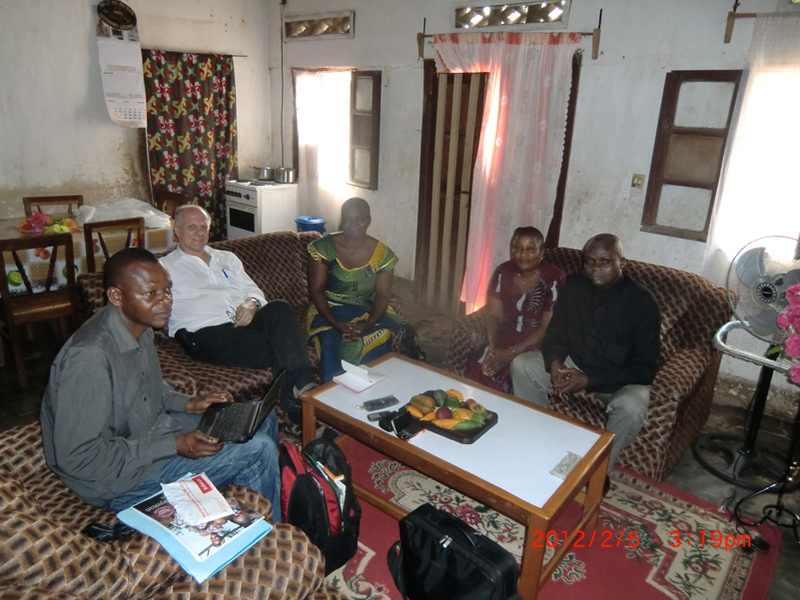 It is one part of the follow-ups to meet and check to see how the entrepreneurs are doing. Damas has suffered two difficulties as an entrepreneur; firstly he was moved and had to leave his old fields, secondly he has been affected by the draught. He has had to start over again in the new place, and that is why he hasn´t been able to follow the payment plan. We drew up a proposition to a new plan, which will have to be authorized by his group and the board of MSG in order to apply. 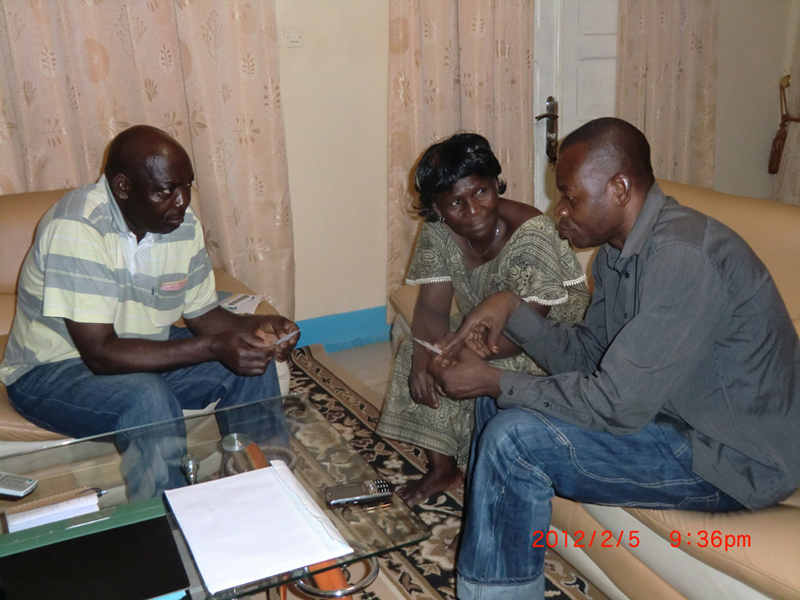 Damas´ wife Npenba offered us cold Coke and other soft drinks, together with bananas and peanuts – a perfect snack! 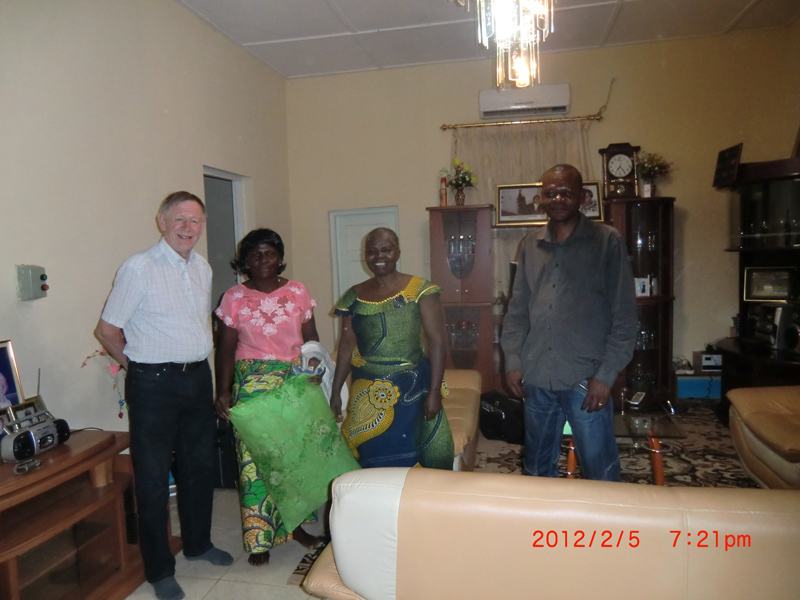 We arrived in Kimpese at 6 o´clock in the afternoon, where we were going to stay with Nganga Diamfunisa and his wife Thresia, a very nice retired couple. Their house had all the comforts you can need, including an air conditioning. For dinner we had goat meat, rice and manioc, for dessert bananas, all of it was very delicious. After the meal Nganga drove us to Emy Miantezila. We had a good chat with him and his son David about family farming. When we got back, I could show hour hosts how to call anywhere in the world with the help of a computer, and at no cost. We talked to Anders in Grovare, Sweden and Aron in Moscow, Russia. Both conversations had excellent video and sound transmission. Matthieu säger att det bästa är att ge pengarna som skall till barnhemmet Prokin till Nsimba Andersson, så kontaktar han Sebastien som kommer och hämtar pengarna på Nzobinati.